Hugh Morrison from Masterton was in the Royal New Zealand Navy Volunteer Reserve, flying with the Fleet Air Arm. On 4 May 1945 he took part in the last air raid of WW2 in Europe, when 44 naval aircraft attacked a submarine base about 100 km from Narvik. Operation Judgement saw two ships and a U-boat sunk, with no civilian casualties in the nearby village. ‘Hughie’ Morrison’s Grumman Wildcat fighter was hit by anti-aircraft fire and crashed into the sea. He was brought ashore but died soon after, and was buried at Narvik. On a recent visit to Narvik New Cemetery I placed a poppy on the grave. New Zealander James Leon Wilkie, RAF, is also buried here. So sad he was killed just days before the war's end. The last Kiwi to die in the air in the Pacific war was also a Fleet Air Arm pilot. and send the photo.They are very proactive about contracting local firms to tidy headstones like that up and encourage people to contact them. Great suggestion, which I've actioned through the CWGC website. 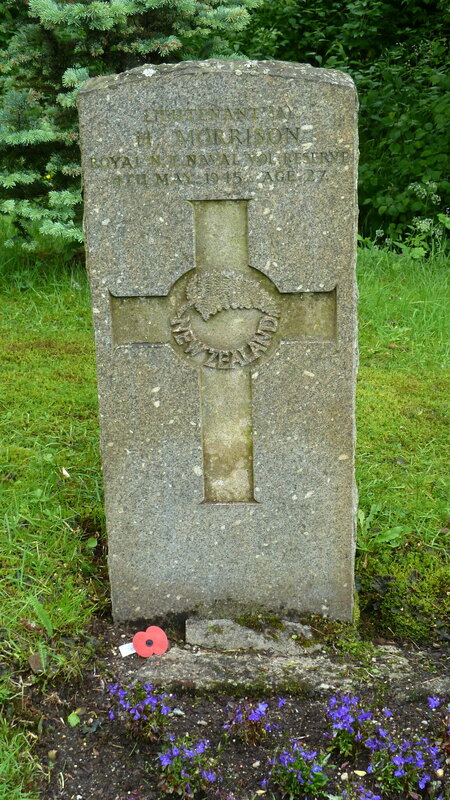 This headstone is nearest to a shelter belt, so is probably in the dampest part of the CWGC part of the cemetery. You're right, the CWGC does a fantastic job of maintaining the graves they're responsible for, and I'm sure will get onto this.